It's only a movie...or is it? "Running Out of Luck is a free- wheeling 80 minute odyessy into the most fantasies and fears of the world's most celebrated and envied rock star (played convincingly by Mick Jagger). 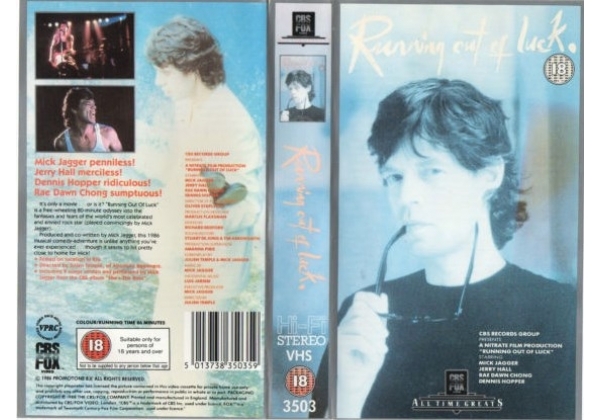 Produced and co-written by Mick Jagger, this 1986 musical-comedy-adventure is unlike anything you've ever experienced ... though it seems to hit pretty close to home for Mick! Directed by Juilen Temple, of Absolute Beginners. Including 9 songs written and performed by Mick Jagger from his CBS album "She's the Boss". Or find "Running Out of Luck" on VHS and DVD / BluRay at Amazon.